You’ve heard about affiliate marketing. And perhaps, you’ve seen people earning a lot from affiliate sales. why should you start promoting affiliate programs? how to earn through affiliate marketing? how to start? And more questions. Perhaps you’ve started but never earned a smile from consistent sales. The fact is that you can earn money with affiliate marketing; but your questions deserve actionable answers first. You need to know the WHAT, the WHY and the HOW. When you know what you are doing, you have a reachable goals you’re committed to, you know how to achieve these goals, noting can stop you. Let’s approach this like we were explaining affiliate marketing for dummies. … Let’s see why you deserve to be here. That definition is perfect. We did not have to reinvent the wheel. It tells us exactly what we should know about affiliate marketing. But we have to break it down to fully understand. Here are some key terms that help you understand better what is affiliate marketing. As you read what they mean, go back to the definition to get their meaning in the sentence. affiliates: someone who promote a product he don’t own nor create to make money. business: a merchant who’s selling service or product for a return on investment. performance-based marketing: promotional methods where you get paid based on your performance. The more effective you are, the more money you earn. You make one sale, you earn 30%. You make 5 sales, you earn 5X 30%. Sometimes, you earn more shares if you bring more sales. And sometimes, you get rewarded with bonus. reward one or more affiliates: more than one person can benefit from a lead or sale. An affiliate who directly make a successful sale always get his commission. But, sometimes, someone else who referred the affiliate make money also. It’s called two-tiers affiliate marketing. visitor or customer: it is a performance based kind of marketing. Not just sale marketing. Some programs pay you per free sign-ups, email submit and obviously, sales. affiliate’s own marketing efforts: sometimes, an affiliate marketer get a one-time commission. Sometimes, that affiliate get repeated commissions, it’s called recurring or residual income. Your earning depends on the affiliate program terms. One sale can bring you revenue for the rest of your life if the customer actively uses the product or service. That definition go beyond the promote someone’s product and get paid doing so. I hope you get it. If you want to learn more, check out the preview videos on Zac Johnson’s course about affiliate marketing. Although it is a paid course, preview it for free. Then buy only if you like what you see. Check the video out. The way affiliate marketing works is simple. 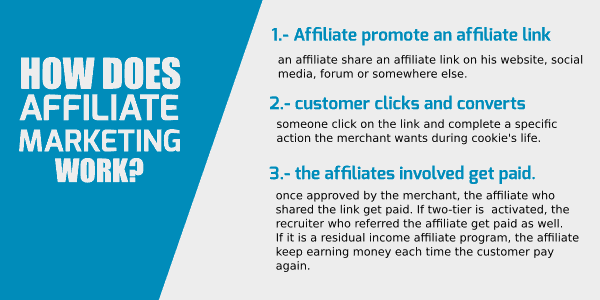 An affiliate marketer share a link of a merchant’s site with his personal tracking ID, a customer buys an item from that link, the merchant share the sale’s earning with the affiliate (s) involved. The customer gets a product that solve one of his problems. The merchant make a sale he, perhaps, would not make without afiliate’s help. The affiliates make money from the sale generated. When it is a residual income program or a two-tier program, the affiliate’s referrer also earn money or the affiliate get paid each time the same customer buy again or renew his plans. How does affiliate performance get tracked? For each affiliate program, the computer remember one cookie. A cookie is a data that the web browser save for a certain time. Each time someone click an affiliate link, a parameter for that affiliate is stored. If someone uses the same browser and click someone’s else affiliate link, the last cookie replace the existing one for the same site till expiration. When someone buys, the affiliate with the cookie stored in browser earn the revenue share. Obviously, immediate sales always get you money. But with cookie, you can make money even if the person purchase 30 days after following your links. Each affiliate program owner sets his own duration for cookies. Some programs allow us to make money 356 days prior the initial click. To start promoting a product as affiliate, you need to join the affiliate program. They offer such option individually or via affiliate networks which connect affiliate with merchants. Then, they’ll give you an URL you can share on your website or anywhere else you’re permitted on the internet such as social media profiles and forums. 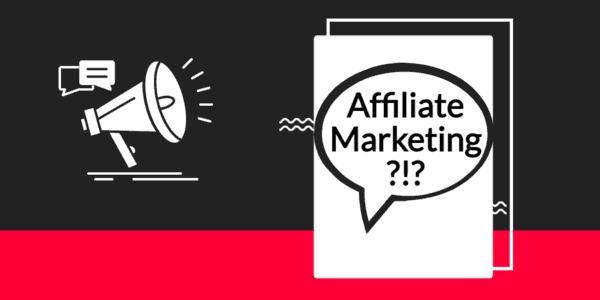 Now, why should you use affiliate marketing? You don’t have to spend time creating products or selling services. It does not stop you from earning with your own products. It can be passive and earn you a full-time income each month. you earn money while you help people for free. ( Income + Honour ). How to start with affiliate marketing and make money? The simple answer is: to start making money with affiliate marketing, you have to join an affiliate program to get an URL and start promoting it. But, the truth is, it does not work so simple. Otherwise, everyone would be rich through affiliate marketing opportunities. In fact, if you don’t want occasional sales each year but a solid affiliate marketing business you can count on, you need an authority website. Affiliate marketing is not a way to be rich quick. It is one of the best way to start a steady online business that earns you 3 to 6 figures each month. On AskEustache.com, I teach how to get more traffic to your authority website to make more affiliate sales. But I help you also to build that authority website; write blog posts that sell on it; before I ask you to drive traffic to make sales. Fill the form below to opt-in for our upcoming actionable tips about getting more traffic and affiliate sales. Get our affiliate marketing starter checklist when it’s ready. By real life example, I mean that the company and earning opportunities are real. You can use it to earn money with affiliate marketing. The merchant: Template Monster is a company which sells HTML 5 templates and themes for WordPress, Jomla and prestashop. The potential customer: Anyone who own a website may need a template. Someone who just start a website is someone you can reach out to and suggest templates that you love. The company has an affiliate program in-house where everyone can help them reach the person they would not reach otherwise and make more sales. But you can partner with them via an affiliate network also: ShareASale. Their base share is: 30% but if you make 50 sales a month, you can earn 40% per sale. It can go up to 50% per sale. That how affiliate marketing can boost your performance. The average sale value is $90. With 50%, you may earn $45 for each sale. If you refer a friend who sign-up as an affiliate, you earn 5% of what he earns each time he makes a commission while your revenue is not deducted from his own. That’s two-tier affiliate marketing. Their cookie live for 365 days in your visitors web browser. If someone who followed your links buy after 360 days, you still get your commission. If they buy once, twice, you still get paid. It’s residual income from repeated sales. Template Monster is one of the few affiliate programs which offer most available affiliate marketing features. I hope their example helped you to handle affiliate marketing better. Most affiliate programs wait 30 to 120 days before processing payment. Just in case the customer ask a refund, a situation where there is no commission to be paid. Each affiliate program has their own terms and payment methods. By example, Template Monster in house affiliate programs pays through Payoneer, Skrill, ACH, PayPal and WebMoney. They pay you when you reach $100 in earning. ShareASale affiliate networks that Template Monster uses pay through ACH. They pay you when you reach $50 in earning. So, the programs are different. Make sure an affiliate program you want to join pay somehow you can cash your earning. Now that you’ve learned what is affiliate marketing, how to start with and why you should use them. The best is to come. How to make money with affiliate marketing. Don’t forget to join our mailing list for actionable content, effective tools and worksheet to build an online affiliate business. You’ve just complete the first step of our series who aim to take anyone who is serious about affiliate marketing from beginner to pro. Have something to say about the subject? Drop it in a comment. You can also reach out to me via the contact page. I was glad I stumbled on your blog as I am so anxious to find help in order to gain sales on my affiliate niche. This lesson what i need for marketing and earn with Affiliate. Thank you!